Flowerstream softly padded out of the warriors den, careful not to wake those who were still sleeping. Still in a tired haze, her mind wandered back to the previous day when she had managed to grab a few bites of the large squirrel. For the first time since she had become a cat, Flowerstream could finally feel the satisfaction of eating a filling meal. She gazed up at the sky. With the sun just beginning to make its appearance in the sky, a new day in a new life was born. Flowerstream curled up in a fairly sunny spot, watching her Clanmates exit their dens. Time seemed to have blurred since she had become a real, actual, BlogClan warrior. She wasn’t sure how long it had been… a week? Three days? A month? She couldn’t tell anymore. The cats called to do the borderpatrol disappeared from sight as they left the clearing to enter into thewoods. “Hopefully they won’t find any signs of the badger on the patrol,” Flowerstream murmured to herself, even though she knew that it wasn’t likely to happen. But still, there was nothing wrong with hoping that the dangerous badger had left BlogClan’s territory. “Flowerstream, you’ll be going on today’s hunting patrol along with Amberstorm, Stormypaw, Blizzardpaw, Hollypaw,and Sandyfoot.” Copperclaw walked off towards Cakestar’s den after she finished her announcement. “Can I go hunting too?” Pricklekit eagerly squeaked. “Please? I really wanna go! The Clan needs me!” The kit added, to prove her point. “But I won’t be an apprentice for such a long time! How’ll I be able to wait for that long? We might be humans again when I do!” The familiar pang of loneliness stabbed her again. What if they were here for a long time? What if they were still cats and someone died of hunger or even the badger? “Pricklekit, I know you’ll be able to manage.” Flowerstream laughed, pushing away her own personal doubts. As she came back from the relatively unsuccessful hunt, Flowerstream noted to herself that while only two small pieces of prey were caught, the warriors and apprentices all seemed to be beginning improving with their skills at hunting. When they had arrived, everyone was clumsy, and not good at even the basic warrior duties. “Cloverpaw, could you please give these mice to the elders and kits?” Flowerstream asked to the nearby apprentice. She seemed distracted, but her eyes showed unreadable emotions. 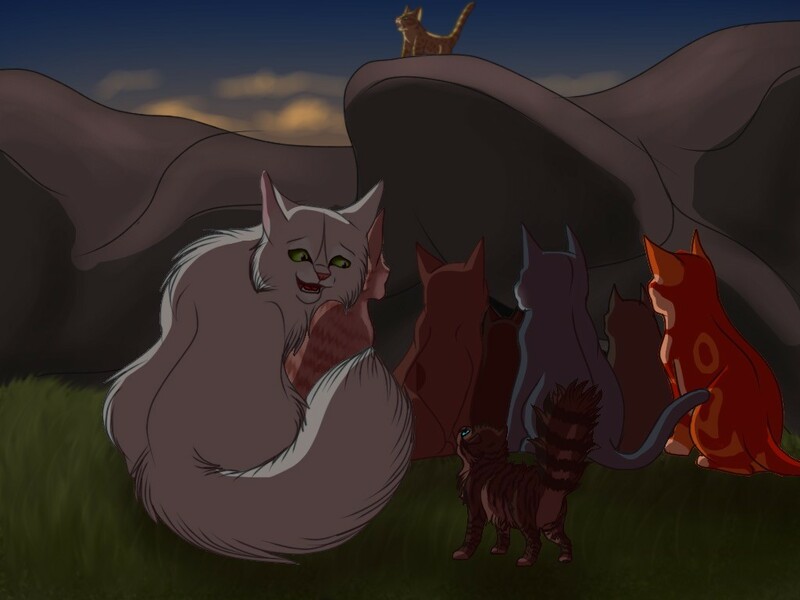 “Sure!” Cloverpaw nodded, trotting off towards the kits with the scrawny prey that Amberstorm and Flowerstream had caught. A stick cracked from behind her. Flowerstream jumped at the sudden sound that broke her out of her thoughts. “Oh, Flame!” she exclaimed, “You scared me half to death.” Her heart pounded, threatening to leap out of her chest at any moment. Flowerstream could see that the nests in the elder’s den and the nursery needed the moss in them to be replaced. She narrowed her eyes, and called her apprentice over. “Sparkpaw, let’s go collect some moss for the dens,” Flowerstream flicked her tail gesturing towards the woods. The two cats headed back to the clearing with jaws full of moss a little bit before sunset, Flowerstream could hear bits and pieces of cheerful conversations going on between her Clanmates. “I hope I get to become an apprentice soon!” Spottedkit was rambling to nearby kits, “That way I’ll have a mentor and then I can defeat the badger.” She did her best impression of a fighting move. “I sort of miss home,” Briarpaw mumbled to Cypresspaw and Dovepaw a few paces away. “I guess that I do too, Briarpaw. But I can’t wait to go hunting, and maybe I’ll catch a squirrel just like Kat and Jayfrost did!” Dovepaw bounced eagerly as she replied to her friend. “There’s so much work to do around BlogClan! Cleaning out the dens, collecting moss, and stuff like that. I really do love being an apprentice but I just wish that I could go on more patrols!” Snakepaw was moaning good-naturedly to apprentices with a similar mindset. From the corner of her eye, Flowerstream could see Hazelpaw and Lakepaw nodding at Snakepaw’s statement. “But at least we’re helping everyone. And look, everyone’s doing some work! Even some of the warriors are occasionally performing apprentice duties.” Hazelpaw replied. “I guess so…” Lakepaw started the reply, and the others echoed her. Flowerstream couldn’t help but smile at the happiness she could see in the eyes of her Clanmates. Even though she really was happy here in BlogClan, she couldn’t agree more with Briarpaw. She missed home so much. Home. Spending days, weeks, or maybe even months as a cat made the concept of home seem weird, almost foreign, to Flowerstream. After she had overheard Briarpaw talking with Cypresspaw and Dovepaw, Flowerstream was confused, and even the slightest bit worried. Is BlogClan my home now? D-do I even have a home anymore? Flowerstream shook that thought outof her head. I know I’ll go back home if it’s the last thing that I ever do!“Want to share your thoughts, Flowerstream?” A golden she-cat emerged from behind her. As the sun began to slowly sink down on the horizon, the camp started to become darker, but Flowerstream was still able to see clearly. As she glanced around the camp, she could notice the changes happening in BlogClan after the hunt from the day before. Cats were getting along with each other much better, and the warriors, apprentices, and elders were celebrating. Everyone seemed full-fed and energized after the successful hunt. But Cakestar was still ill with greencough, and Flowerstream knew that their leader needed to heal, or else BlogClan wouldn’t survive. The smallest kit knew that, and a feeling of dread and uncertainty left Flowerstream with the lingering thought that things in BlogClan were probably going to get a lot worse before more progress in the Clan would be made. 70 Responses to "Trailing Stars, Chapter 15; by Flowerstream"
Sighhhhh, can the next writer include my name? Can I be in the next chapter? pretty please with a squirrel on top?